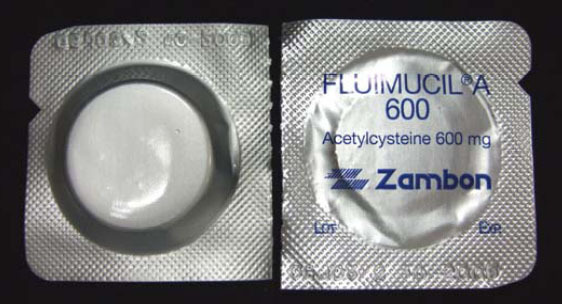 Fluimucil (Acetylcysteine) 通常是用來化痰, 600mg, 一天吃1-2次. Fluimucil (Acetylcysteine) 亦可用作為 Acetaminophen中毒解毒劑. Acetaminophen中毒使用140mg/kg loading, 70mg/kg X 17 doses. 如果準備接受放射性造影劑的心臟病人身上也會用到,是為了預防顯影劑造成的腎衰竭. 通常檢查前前一天, 當天, 後一天會使用Fluimucil 600mg, 不過一天用兩次用三天就夠了. Acetylcysteine, also known as N-acetylcysteine or N-acetyl-L-cysteine (abbreviated NAC), is a pharmaceutical drug and nutritional supplement used primarily as a mucolytic agent and in the management of paracetamol (acetaminophen) overdose. Other uses include sulfate repletion in conditions, such as autism, where cysteine and related sulfur amino acids may be depleted. Intravenous acetylcysteine is indicated for the treatment of paracetamol (acetaminophen) overdose. When paracetamol is taken in large quantities, a minor metabolite called N-acetyl-p-benzoquinone imine (NAPQI) accumulates within the body. 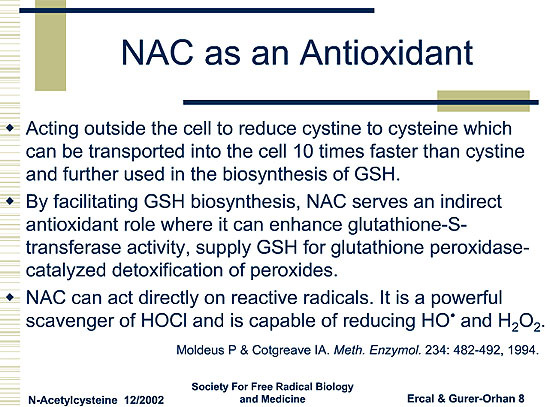 It is normally conjugated by glutathione, but when taken in excess, the body's glutathione reserves are not sufficient to inactivate the toxic NAPQI. This metabolite is then free to react with key hepatic enzymes, therefore damaging hepatocytes. This may lead to severe liver damage and even death by acute liver failure. For this indication, acetylcysteine acts to augment the glutathione reserves in the body and, together with glutathione, directly bind to toxic metabolites. 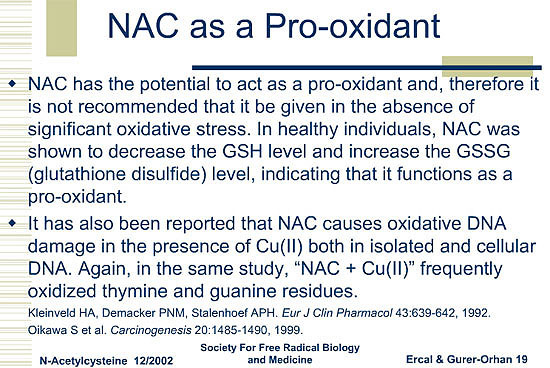 These actions serve to protect hepatocytes in the liver from NAPQI toxicity. Although both IV and oral acetylcysteine are equally effective for this indication, oral administration is poorly tolerated because high oral doses are required due to low oral bioavailability, because of its very unpleasant taste and odour, and because of adverse effects, particularly nausea and vomiting. 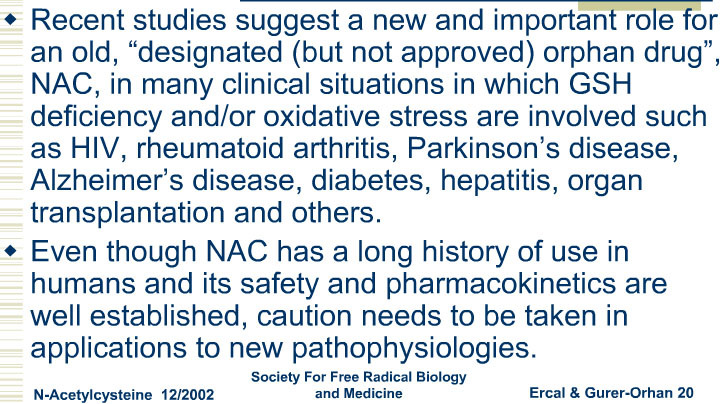 Studies conducted by Baker and Dilger suggest that the prior pharmacokinetic studies of acetylcysteine did not include acetylation as a reason for the low bioavailability of acetylcysteine. In the research conducted by Baker, it was concluded that oral acetylcysteine was identical in bioavailability to cysteine precursors. However, 3% to 6% of people given intravenous acetylcysteine show a severe, anaphylaxis-like allergic reaction, which may include extreme breathing difficulty (due to bronchospasm), a decrease in blood pressure, rash, angioedema, and sometimes also nausea and vomiting. Repeated doses of intravenous acetylcysteine will cause these allergic reactions to progressively worsen in these people. In some countries, a specific intravenous formulation does not exist to treat paracetamol overdose. In these cases, the formulation used for inhalation may be used intravenously. 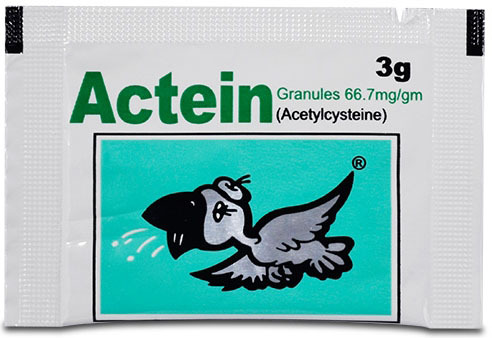 Inhaled acetylcysteine is indicated for mucolytic ("mucus-dissolving") therapy as an adjuvant in respiratory conditions with excessive and/or thick mucus production. Such conditions include emphysema, bronchitis, tuberculosis, bronchiectasis, amyloidosis, pneumonia, cystic fibrosis, chronic obstructive pulmonary disease, and pulmonary fibrosis. It is also used post-operatively, as a diagnostic aid, and in tracheotomy care. It may be considered ineffective in cystic fibrosis. However, a recent paper in the Proceedings of the National Academy of Sciences reports that high-dose oral acetylcysteine modulates inflammation in cystic fibrosis and has the potential to counter the intertwined redox and inflammatory imbalances in CF. 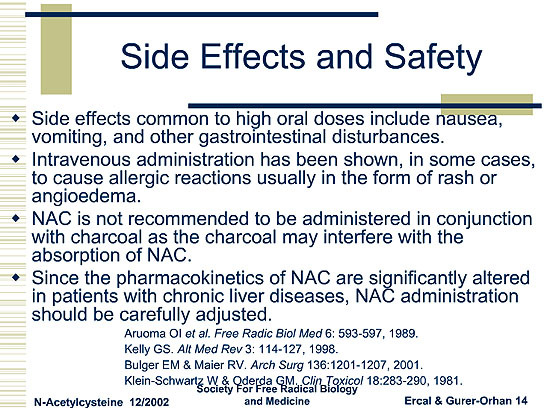 Oral acetylcysteine may also be used as a mucolytic in less serious cases. For this indication, acetylcysteine acts to reduce mucus viscosity by splitting disulfide bonds linking proteins present in the mucus (mucoproteins). 1. "Intravenous and oral N-acetylcysteine may prevent contrast-medium–induced nephropathy with a dose-dependent effect in patients treated with primary angioplasty and may improve hospital outcome." 2. "Acetylcysteine protects patients with moderate chronic renal insufficiency from contrast-induced deterioration in renal function after coronary angiographic procedures, with minimal adverse effects and at a low cost"
A clinical trial from 2010, however, found that acetylcysteine is ineffective for the prevention of contrast-induced nephropathy. This trial, involving 2,308 patients, found that acetylcysteine was no better than placebo; whether acetylcysteine or placebo was used, the incidence of nephropathy was the same — 13%. Acetylcysteine continues to be commonly used in individuals with renal impairment to prevent the precipitation of acute renal failure. Acetylcysteine has been used for cyclophosphamide-induced hemorrhagic cystitis, although mesna is generally preferred due to the ability of acetylcysteine to diminish the effectiveness of cyclophosphamide. Acetylcysteine can be used in Petroff's method i.e. liquefaction and decontamination of sputum, in preparation for diagnosis of tuberculosis. It also displays significant antiviral activity against the influenza A viruses. 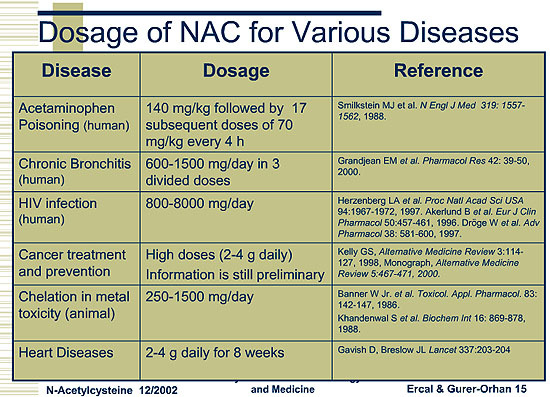 Acetylcysteine is used in the treatment of interstitial lung disease to prevent disease progression. Acetylcysteine has been successfully tried as a treatment for schizophrenia, acute mood episodes (e.g. depression, mania, hypomania) as part of bipolar disorder, unipolar depression, trichotillomania, skin picking, autism, obsessive-compulsive disorder, drug (including nicotine, cannabis, methamphetamine, cocaine, etc.) and gambling addiction. In a small prospective trial comparing acetylcysteine to metformin (which is the standard drug treatment for PCOS), both treatments resulted in a significant decrease in body mass index, hirsutism score, fasting insulin, HOMA index, free testosterone and menstrual irregularity compared with baseline values, and both treatments had equal efficacy. Antioxidants are widely used to protect cells from damage induced by reactive oxygen species (ROS). The concept that antioxidants can help fight cancer is deeply rooted in the general population, promoted by the food supplement industry, and supported by some scientific studies. However, clinical trials have reported inconsistent results. We show that supplementing the diet with the antioxidants N-acetylcysteine (NAC) and vitamin E markedly increases tumor progression and reduces survival in mouse models of B-RAF– and K-RAS–induced lung cancer. RNA sequencing revealed that NAC and vitamin E, which are structurally unrelated, produce highly coordinated changes in tumor transcriptome profiles, dominated by reduced expression of endogenous antioxidant genes. 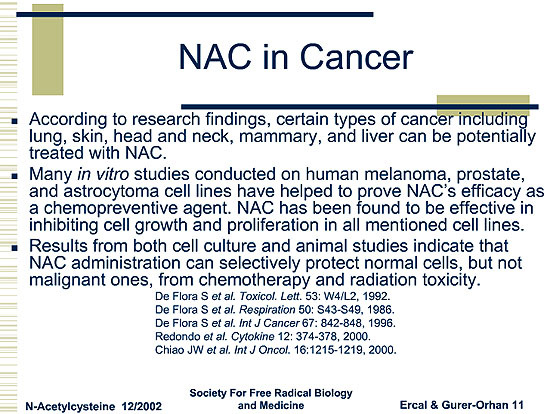 NAC and vitamin E increase tumor cell proliferation by reducing ROS, DNA damage, and p53 expression in mouse and human lung tumor cells. Inactivation of p53 increases tumor growth to a similar degree as antioxidants and abolishes the antioxidant effect. Thus, antioxidants accelerate tumor growth by disrupting the ROS-p53 axis. Because somatic mutations in p53 occur late in tumor progression, antioxidants may accelerate the growth of early tumors or precancerous lesions in high-risk populations such as smokers and patients with chronic obstructive pulmonary disease who receive NAC to relieve mucus production. 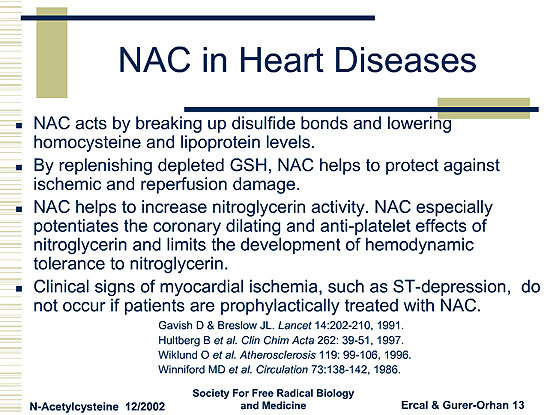 Along with its needed effects, acetylcysteine may cause some unwanted effects. Although not all of these side effects may occur, if they do occur they may need medical attention. (From RxList) N-acetyl cysteine comes from the amino acid L-cysteine. (Amino acids are the building blocks of proteins). ● Helping to prevent crusting in people with tracheostomy. ● Reducing mucus and helping with breathing in various lung conditions. ● Preventing complications of chronic bronchitis. ● Preventing complications of lung disease (chronic obstructive pulmonary disease, COPD). ● Preventing side effects of ifosfamide (Ifex, used for certain types of cancer). ● Preventing kidney problems with dyes used during some X-ray exams. ● Reducing homocysteine levels (a possible risk factor for heart disease). ● Reducing symptoms of the flu. ● Treating some types of epilepsy (seizures). ● Treating a lung disease called fibrosing alveolitis. ● Preventing problems such as heart attack and stroke in people with serious kidney disease. ● Preventing side effects of doxorubicin (used for certain types of cancer). ● Treating amyotrophic lateral sclerosis (ALS, Lou Gehrig's disease). ● Preventing new tumors in people with head and neck cancer, or lung cancer. ● Improving how the body responds to nitroglycerin (Nitrostat). ● Carbon monoxide poisoning; allergic reactions to phenytoin (Dilantin); ear infections; hayfever; removing heavy metals such as mercury, lead, and cadmium from the body; chronic fatigue syndrome (CFS); preventing alcoholic liver damage; protecting against environmental pollutants; colon cancer; and other conditions. ● For acetaminophen (Tylenol) overdose: at the beginning of treatment, a first high dose of 140 mg/kg of a 5% solution of N-acetyl cysteine is given. The commercially available 10% and 20% solutions may be diluted with water, carbonated, or non-carbonated beverages, and given through a straw to lessen the unpleasant odor of N-acetyl cysteine. Seventeen additional doses of 70 mg/kg as a 5% solution are given every 4 hours, for a total dose of 1330 mg/kg over 72 hours. ● For chest pain that is not relieved by rest (unstable angina): 600 mg of N-acetyl cysteine three times daily with a nitroglycerin patch. ● For preventing sudden worsening of chronic bronchitis: doses of 200 mg twice daily, 200 mg three times daily, 300 mg slow-release twice daily, and 600 mg controlled-release twice daily have been used. ● For treating chronic obstructive pulmonary disease (COPD): 600 mg of N-acetyl cysteine once daily, in addition to standard care, has been used for up to 6 months. ● For treating a lung condition called fibrosing alveolitis that makes breathing difficult: 600 mg of N-acetyl cysteine 3 times daily. ● For preventing damage to the bladder due to treatment with a cancer drug called ifosfamide: 1 to 2 grams of N-acetyl cysteine every 6 hours. ● For reducing levels of homocysteine in the blood: 1.2 grams of N-acetyl cysteine daily. ● For myoclonus epilepsy: 4-6 grams daily. ● For reducing flu symptoms: 600 mg twice daily. ● For reducing the risk of heart attacks and strokes in patients with end-stage kidney disease: 600 mg twice daily. ● For skin wounds due to hemodialysis treatment: 200 mg four times daily or 600 mg twice daily. ● For preventing kidney damage associated with the use of iopromide (Ultravist-300) for diagnostic tests: 400 to 600 mg of N-acetyl cysteine twice daily on the day before and on the day of iopromide administration, with IV saline (0.45%) 1 mL/kg body weight per hour for 12 hours before and 12 hours after iopromide administration. ● For trichotillomania (hair-pulling): N-acetyl cysteine 1200 mg to 2400 mg daily has been used. ● Healthcare providers give N-acetyl cysteine intravenously (by IV) for acetaminophen poisoning.